Turn your knowledge of netting into a tube and just keep on stitchin’! 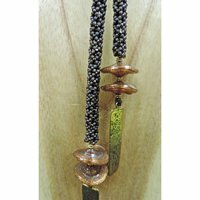 This two-part lariat makes a wonderful showcase for any special beads. We’ve used Starr’s beautiful hand-made lampwork beads as the dangles.